Ball Grabbers is a two-player physics-based arcade game mixing soccer with fighting. Pick any of the three characters in the roaster and beat your rival in fierceful matches set in 5 different arenas. Toss, dash, tackle, jump and throw the ball as you beware of obstacles, animals, bombs and traps. 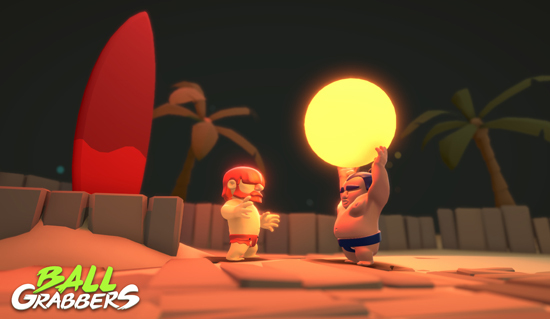 “Ball Grabbers captures the spirit of neo classics such as Gang Beasts and Mario Strikers, and it introduces a whole new gameplay perspective” says Tuomas Erikoinen, founder at Part Time Monkey. “If you play against a friend, endless fun is fully guaranteed”. Ball Grabbers plays best with controllers, but it can also be enjoyed on a single keyboard by two players - like back in the day! The game features 1v1 local matches only upon release. Ball Grabbers 1v1 Sports-Fighting game is now available on PC for $4.99.